We are the largest public school board in Northern Ontario. Rainbow District School Board offers English and French Immersion programs from Kindergarten to Grade 12 in Sudbury, Espanola, Manitoulin Island and Shining Tree. We bring learning to life, enabling students to fulfill their aspirations. This guide contains important information that will serve as a handy reference for parents/guardians throughout the school year. Learn about the Board's Strategic Directions for 2016-2020. Rainbow District School Board covers a geographic area of more than 14,757 square kilometers in the heart of Rainbow Country. Rainbow District School Board provides quality programs and character education to students in Sudbury, Espanola, Manitoulin and Shining Tree. The Board also offers educational programs at Barrydowne College (a re-engagement school at Cambrian College), the N’Swakamok Native Friendship Centre, the Shkagamik-Kwe Health Centre, the Children’s Treatment Centre, the Child and Adolescent Mental Health Program, Frank Flowers School and Cecil Facer Secondary School. 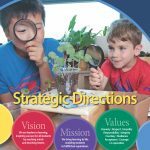 Learn about our vision, mission, values, and priorities as well as our commitment to accessibility, equity and inclusive education, character education, and sustainability. Access the Board’s business plans and other financial documents. Access the Board’s Organizational Chart for 2017-2018.